Its starting to cool down in Ashikaga. This week was the first that I fired up my little electric space heaters. There is a new exhibit at the Ashikaga Art Museum that I wouldn't mind checking out. I can't read the advertisements, but the pictures show religious themed paintings that seem to mix Western Christian and Indian traditions. I'm not super interested in religious art usually, but the prints I saw were very eye catching. My gripe is the 7 dollars it costs to enter the museum. Most(maybe even all) museums that I have visited in Japan have had an entry fee. I wonder why that is. I really don't want to pay to get into that museum again... I've already been in there three times. Normally I would say they could let people in free, and then try to make up the money from purchases at the gift shop or some other way. But that business model depends on the ravenous demand for everything that Americans have. Maybe the Japanese just don't spend enough for that to work. I don't know. 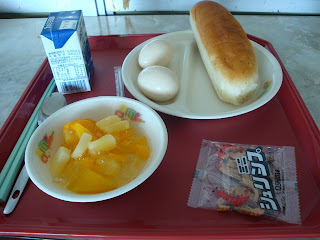 Here is yesterday's school lunch. My favorite part was the peeled hard boiled eggs. The kids only get one, but I am special. Next is the "cheese bread", which was a bit rough. Imagine a normal dinner roll with some shredded mozzarella mixed into the dough. The cheese had hardened again in weird lumps within the bread... bad idea. The fruit was good times, can't go wrong there. The little bag contains dried whole shrimp, which aren't too bad. I told the kids that I was sitting with a story about how I had a pet turtle when I was a kid, and that I fed it dried shrimp not unlike the ones I was now eating. The kids didn't think that was too funny, but I think the turtle would see the humor in it. There was a bowl of noodle soup offered as well, but the soup in the teachers' room is always cold, and cold soup on a cold day isn't very good for my soul. A few of these signs have popped up around town. 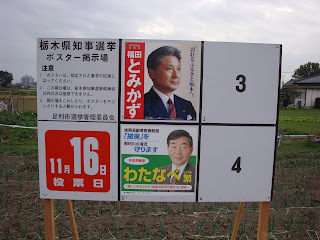 They are advertising the mugs of the candidates vying to become the governor of Tochigi Prefecture, of which I am a most loyal subject. Very exciting.